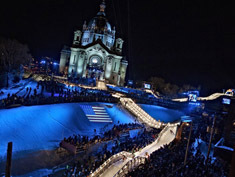 The Red Bull Crashed Ice Ice Cross Downhill World Championship returns to the State of Hockey for the fourth year in a row. This year, the St. Paul Cathedral is the first of four stops and the only event in the U.S.
APWA-MN Chapter members won't want to miss a behind-the-scenes Technical Tour hosted by the City of St. Paul. Matt Morreim with St. Paul Public Works will give us an insider tour. Where: We plan to meet at Shamrocks on West 7th Street and take a bus to/from the event with a happy hour to follow. RSVP: Email Pat Schutrop if you are interested so we can have a headcount for the bus.